Hard surface trails for bikes are becoming a big part of people’s outdoor adventures. Look for the Red Jacket Trail System in southern Mankato or the trail from the town of Franklin out to Fort Ridgely State Park. More trails are being planned to connect communities along the Minnesota River and beyond. Most of these trails are for multi-uses. 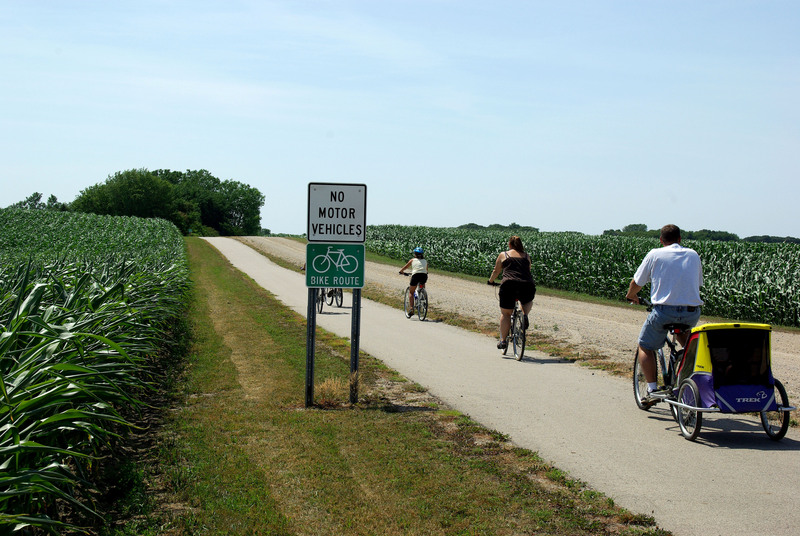 Go for a six mile ride from Fairfax out to Fort Ridgely State Park (Photo below by Ron Bolduan). Minnesota Valley State Recreation Area - http://www.dnr.state.mn.us/state_parks/minnesota_valley/index.html Located in the Lower Minnesota River Watershed between Shakopee and Chaska, this state recreation area has 6 miles of paved bike trails and 35 miles of mountain bike trails. Glacial Lakes State Park - http://www.dnr.state.mn.us/state_parks/glacial_lakes/index.html On the far northwest edge of the basin, this state park has 5 miles of paved bike trails. Camden State Park - http://www.dnr.state.mn.us/state_parks/camden/rec.html Close to Marshall, this state park has a 4.25 mile mountain bike trail. Fort Snelling State Park - http://www.dnr.state.mn.us/state_parks/fort_snelling/index.html At the confluence of the Minnesota and Mississippi rivers, this state park has 5 miles of paved bike trails and 10 miles of mountain bike trails.